Check out Rachael’s Design portfolio, which highlights Rachael’s work as a marketer and graphic designer. This portfolio includes pictures and videos that Rachael created for various marketing purposes for movie and stage theatre companies in New York and across the country. For more information, please contact rachaellangtontheatre@gmail.com. This is a trailer Rachael edited to promote Goodfellas, a movie that played at Village East Cinema in January 2019 as a part of their 35MM series. This is the marketing campaign Rachael designed for Musical Mondays a film series that played once a month at Village East Cinema. This campaign focused on the fun aspects of movie musicals to invite audiences to join us for this musical extravaganza. Check out a trailer Rachael created for this series below. This is a trailer Rachael created for a double feature of The Wizard of Oz and The Wiz, that played at Village East Cinemas in January 2019. This trailer is part of a larger marketing campaign for the movie series, Musical Mondays, where one musical movie is played on the big screen each month at Village East Cinemas and Reading Cinemas Grossmont. This is a sample of marketing materials Rachael designed to promote Hedda Lettuce, a monthly series that played at Village East Cinema where New York City drag queen Hedda Lettuce presents classic movies with fun introductions and giveaway prizes. This campaign focused on the glamor of cinema as well as appealed to Hedda’s existing fan base. These materials were used to promote the Reel Kids Series, an annual series where theatres play childhood movies every week throughout the summer. This marketing campaign was aimed towards young families, as a cheap and fun summer family activity. 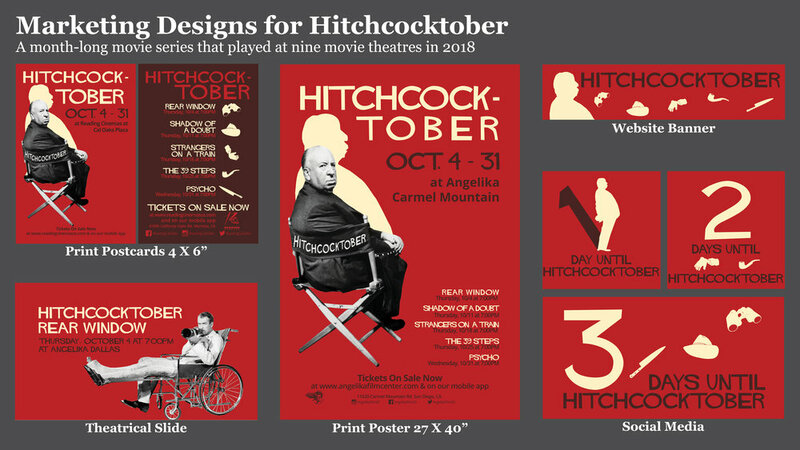 These are samples of marketing materials Rachael created to promote Hitchcocktober, an annual series devoted to the Master of Suspense, which played at nine movies theatres throughout the country in 2018. These marketing materials promoted a film series that focused on the Leading Ladies of Hollywood. The aim of this campaign was to highlight the glamor and power of these golden age actresses, and invite people to see their daring performances on screen again.